Gum disease is surprisingly common among adults. It’s estimated that nearly 80% of Americans have suffered from some stage of gum disease during their lifetime. Gum disease is brought on by an infection in the gums that is typically caused by harmful bacteria. Many people who have gum disease often don’t realize they’re suffering. Its symptoms can be easily dismissed. Because of this, gum disease is the leading cause of tooth loss in adults. If you have any of these symptoms, you may be suffering from gum disease. At Echeverri Dental Center, we can properly diagnose your symptoms and get you the treatment you need. 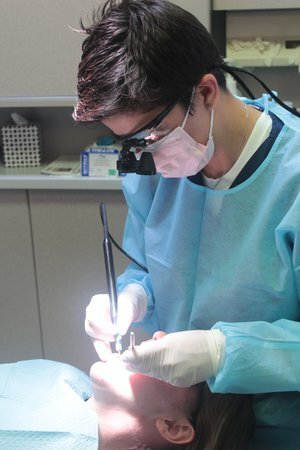 At our Houston, TX dental center, we perform root planing and scaling to help treat your gum disease. Root planing and scaling is a deep cleaning of your teeth and gums. This helps remove harmful bacteria that causes gum disease. Most of the time, our deep cleanings are highly effective in eradicating gum disease. However, sometimes gum disease may be so far evolved and extensive that surgery is required. We do not perform surgery in our office. Instead, we will refer you to a superb surgeon that can efficiently treat your gum disease. Call Echeverri Dental Center to learn more about gum disease treatment. Contact us today to schedule an appointment.